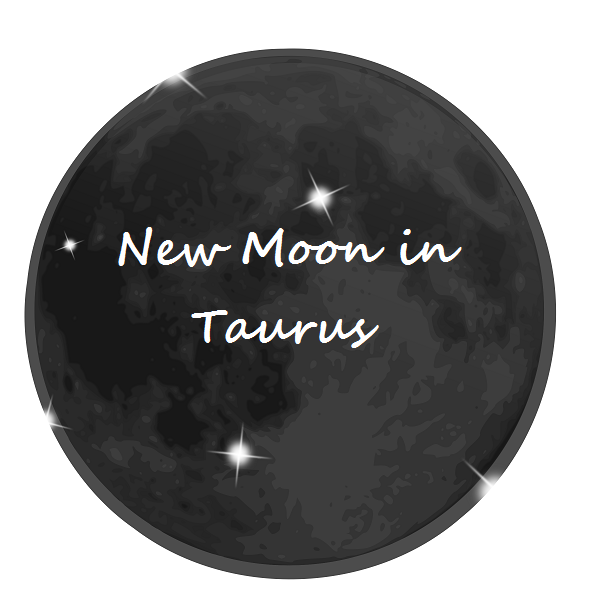 Tomorrow, May 15, 2018 at 7:49 a.m. EST, we will be experience the New Moon in the sign of Taurus at 24 degrees. Individuals with planets linked to this placement (especially by conjunction, opposition and square) will particularly be influenced by the energies. A conjunction will intensify the energies of this New Moon; the opposition often denotes outside influence from others, while the square indicates stress or tension from energies pushing you to advance through this period. The influence of these energies will depend on the planets and houses involved with this configuration. Pay particular attention to the house placement of the New Moon in the natal chart. Those individuals who do not have planets or angles involved with this New Moon’s placement may find that nothing much happens and this period will go by unremarkable. The New Moon phase always suggest beginnings or the time to plant the seeds of change. The energies of this New Moon and the energies of the sign of Taurus often work well together as the Moon is exalted in the sign of Taurus. With the Moon at 24 degrees, it is in the 3rd decan of Taurus and this decan bringing with it qualities linked to Capricorn as well. Because of this there are stability factors in place especially when related to your occupation and goals in life. However this may not just fall in your lap as Saturn’s ruler ship of Capricorn often suggests hard work and diligent effort is required. If you do not skip any steps and are diligent in your efforts, the chances for success or some form of achievement is quite possible. Much, of course, depends on the other factors (aspects from other natal planets to this configuration) in the horoscope. The natal potential found in our birth chart always has to be determined before making judgements and predictions on possibilities from current aspects. There currently is a trine to transiting Pluto which is at 21degrees Capricorn. This speaks in terms of transitions and transformations possibly coming to the forefront during this phase of the new moon. Pluto nearly always speaks of changes that are a requirement for the inner self and which will promoting growth often through adversity or confrontation. In this case transiting Pluto is in trine to this placement and as a result is offering up opportunities and the potential if easy flow of energies. If this is still linked to the occupation or goals then this might be a good time to advance forward in your chosen direction, although once again the whole chart needs to be evaluated before advancing. There is also a distant trine from transiting Mars out by 5 degrees as transiting Mars will be at 29 degrees Capricorn under the influence of the New Moon. Mars often provides the momentum to push forward (sometimes this momentum is in aggressive manners). Tied with Pluto, the energies will be strong for change and there should be a real push to advance, however it should be pointed out that aggressive actions always have ramifications. We should always advance with some caution or at least make sure that we are ready for this move and have taken the required time to prepare for what we may be undertaking (Saturn will insist on this). The energies that are in place are offering up the potential for more stability due to the influence of Taurus. Security is also possible if we make sure things are in place and we are well prepared. Taurus is often a stabilizing factor and Capricorn suggests hard work and discipline but also offers up concrete results through hard work and preparation. Take advantage of these energies. Allow and be open to all energies that have potential to manifest during this upcoming period. The next Full Moon in Taurus (October 2018) should brings to fruition the seeds (efforts) that have been planted now.